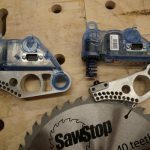 We recently took the SawStop Jobsite Saw JSS to our jobsite to evaluate. 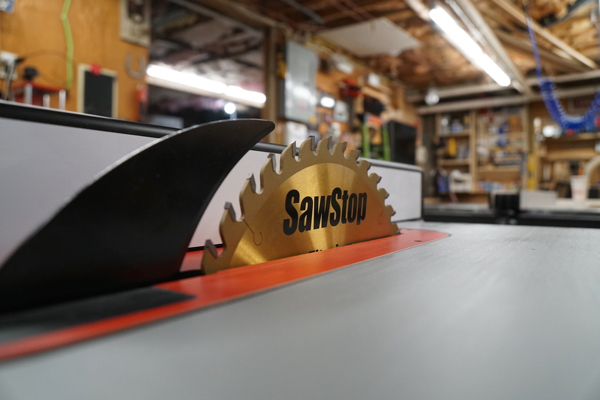 SawStop table saws are famous for their flesh sensing blade braking technology that stops the saw within 5/1000ths of a second after contact with skin. 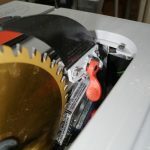 While a lot of hoopla has surrounded this saw what often gets lost in translation is that with or without the flesh sensing brake technology, this saw offers premium features and performance. 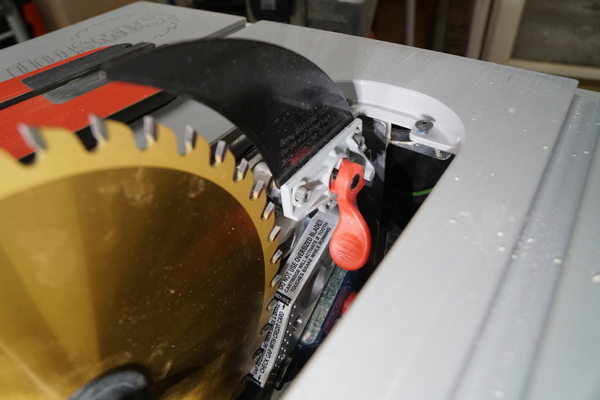 The saw blade carries a small electrical signal which monitors and detects skin contact with the blade, the signal in the blade changes because the human body is conductive. 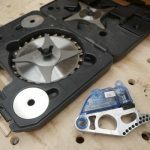 Once the signal changes, the saw activates a braking system which is a spring loaded, aluminum brake that embeds into the spinning blade, stopping it in 5/1000ths of a second. 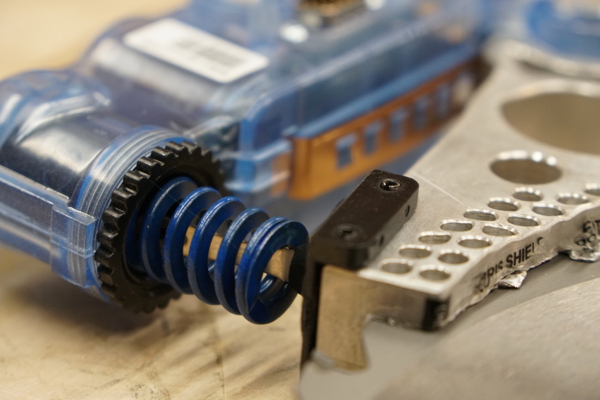 The brake and blade collision momentum drives the blade beneath the table top, removing the blade from view, and simultaneously turning off the saw motor. After an activation the saw needs to be reset. 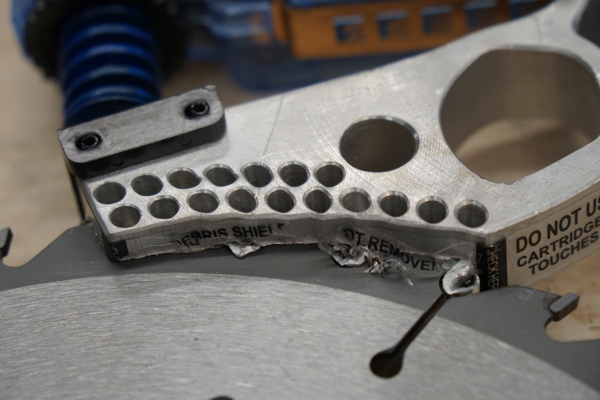 This is accomplished by replacing the saw blade and activated SawStop brake cartridge. The reset process takes approximately five minutes. 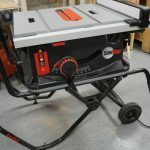 The SawStop Jobsite Saw has a 1.5 HP motor [15 Amp, 120 VAC 60 Hz Universal] equipped with a 10-inch diameter blade. It weighs 79 lbs and 108lbs when attached to the stand. 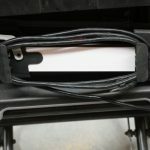 The motor spins a Poly-V static dissipative belt and the cord is 9’6” long. 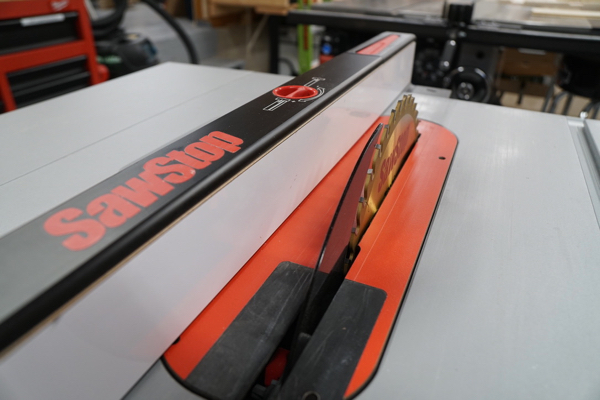 The saw is powerful enough and capable of handling an 8-inch by 13/16” wide dado blade. 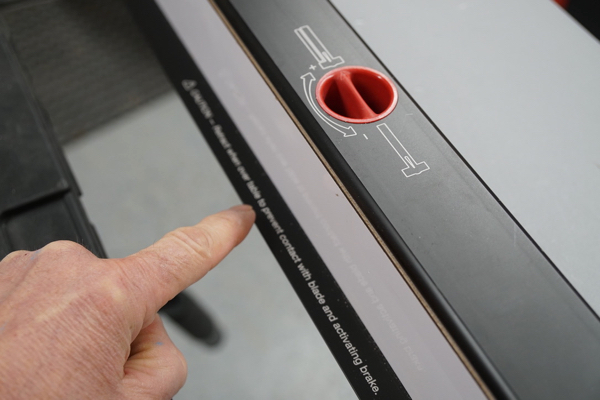 If a dado is attached to this tool you will need to attach a dado brake cartridge, which is wider, sold separately. Smaller dados WILL NOT work on this saw. Changing the blade bevel is equally simple. 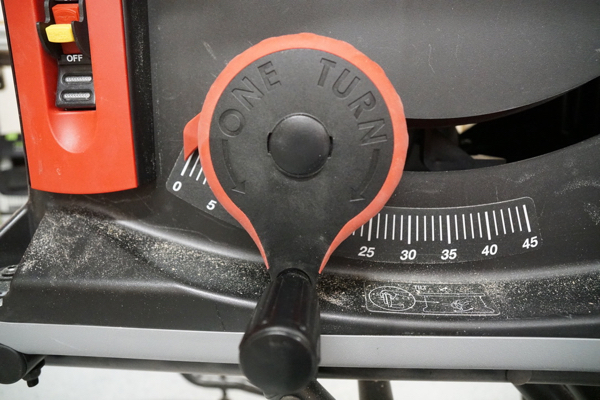 A quick-tilt squeeze handle, located behind the hand wheel quickly and easily achieves your desired angle in 1° increments. 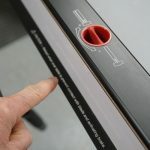 The bevel stops and locks in place, as soon as you release the lever. A micro adjust knob then allows you to fine tune your tilt plus or minus a degree. 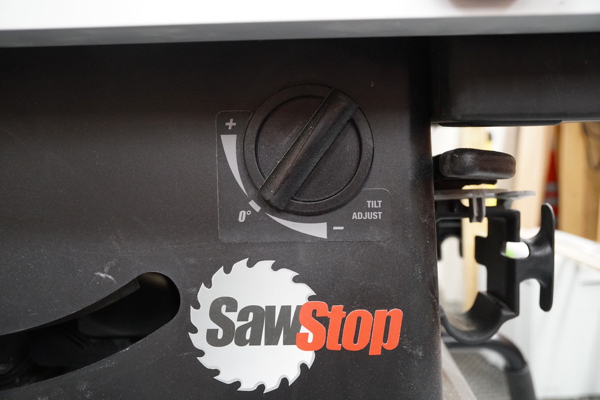 The SawStop table saw power control switch can be confusing at first glance. 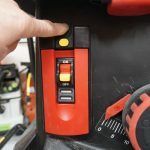 There is a power switch that controls the electronics for the saw and then a larger start / stop paddle. 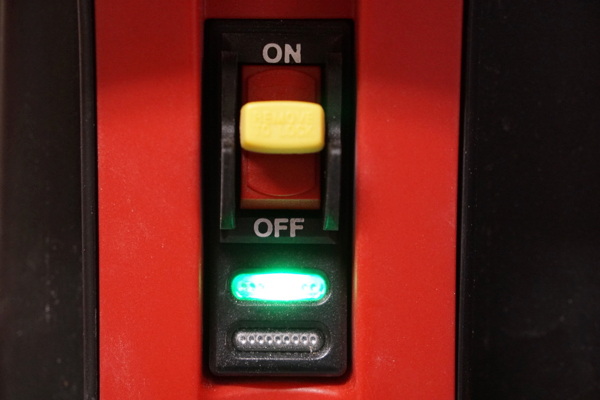 In between the two switches are green and red LED indicator lights. 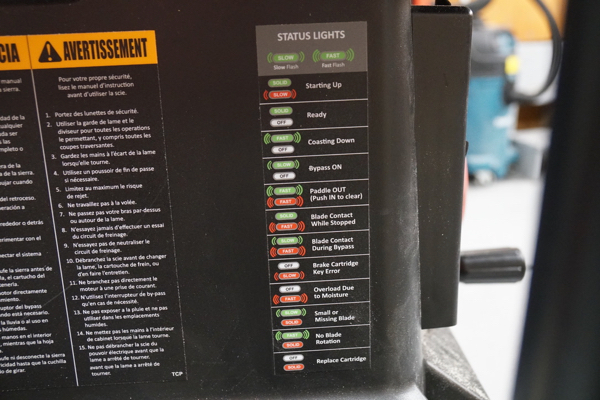 The LED indicator lights provide up to 12 different conditions, and a quick reference, all weather label is attached to the side of the saw, next to the switch for quick reference. 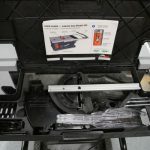 Additionally, there is a color coded guide with instructions on top of the saw accessory drawer, in case you lose the user guide. 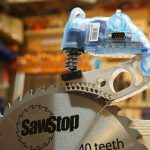 SawStop also provides a high quality moisture resistant User Guide that stores in the accessory drawer – so you always have access to it for codes and cartridge information. Cutting CONDUCTIVE materials in normal mode WILL cause the saw brake to active. 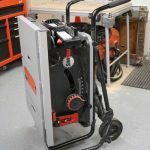 The saw can be set into bypass mode to cut conductive materials or to test the conductivity of a material you may be suspicious of. In bypass mode there is NO saw blade brake protection. Switch power on and wait for red light to turn off. Press in and hold the bypass switch, wait for the red light to flash once. 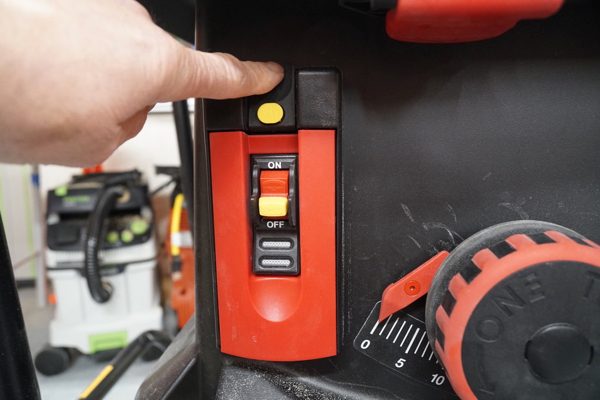 While pressing bypass button, pull out the red on/off paddle to spin blade. Keep pressing until red light flashes once, then release. The GREEN light flashes when the saw is in bypass mode. Push on/off paddle switch in to deactivate bypass mode and stop saw. 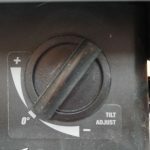 Note – there is a plastic key that allows you to disable bypass mode. If you suspect, that the material you want to cut may activate the brake cartridge, then you can utilize the bypass mode to test the conductivity of the material. 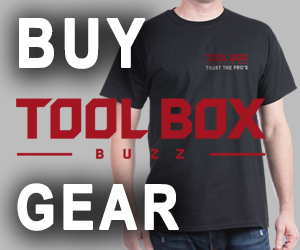 Remember – once you cycle the saw power switch the saw comes out of bypass mode. The fence is a T-Style Fence, which self-squares when locked into position. The “ErgoLock” rocker paddle switch lever is located on the top of the fence and locks and unlocks the fence. We found is fast and simple to use. 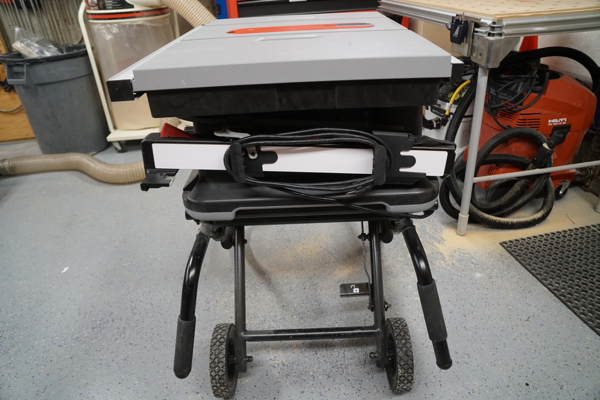 The SawStop Job Site Saw has a cleverly-designed table extension for ripping wider boards. 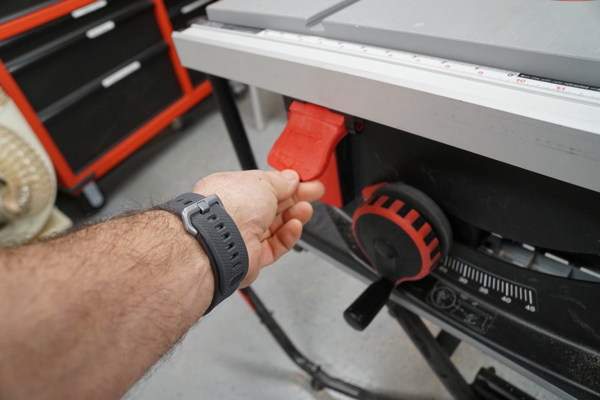 A “flip-up,” release lever on the front of the saw allows you to slide the right side table. The table rides on rails and slides out for a maximum rip cut of 25-1/2” right of the blade. 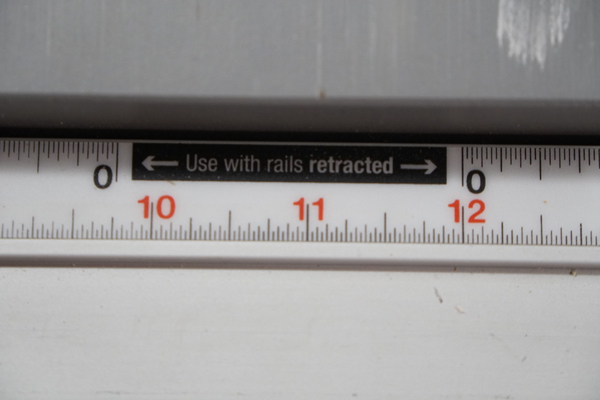 The width of the cut is shown by the red indicator line over ruler. 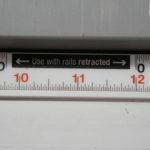 The upper scale is used when the table is retracted and the lower scale is for when the table extension rails are extended. 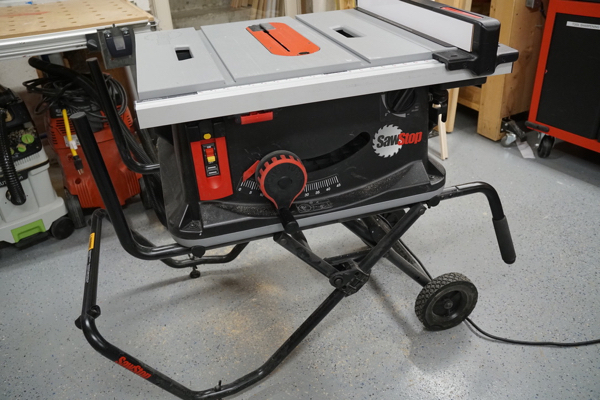 The SawStop Job Site Saw comes with a tool-free, riving knife, and low-profile blade Polycarbonate guard which increases visibility and still protects against kickbacks. A lever quickly allows you to switch between the micro guard and the 2.3mm thick, riving knife. 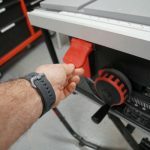 We’ve never been fans of plastic blade guards but the SawStop guard is designed slightly different. It has three independent operating wings on each side. These wings make it easier to lift a partial section to measure the fence to blade, and really shined when we were cutting on a bevel. 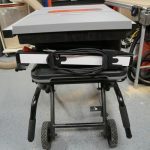 The blade guard spreader and riving knife are designed to be used with 10-inch blades with a kerf between 2.35mm and 3.5 mm, and a blade body of 1.8 mm and 2.1mm. 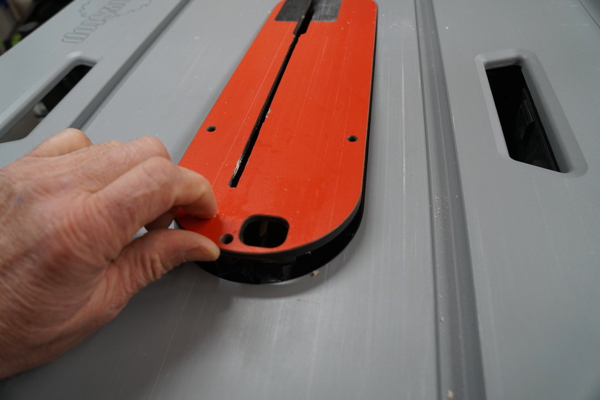 The zero-clearance insert that comes with the saw is tool free, and easily slides up and out for removal. 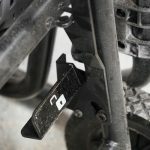 This insert secures in place with a spring-loaded finger pull mechanism. Located under the sliding extension table is an accessory storage drawer. We really like this set up and were impressed with the innovation and space usage. 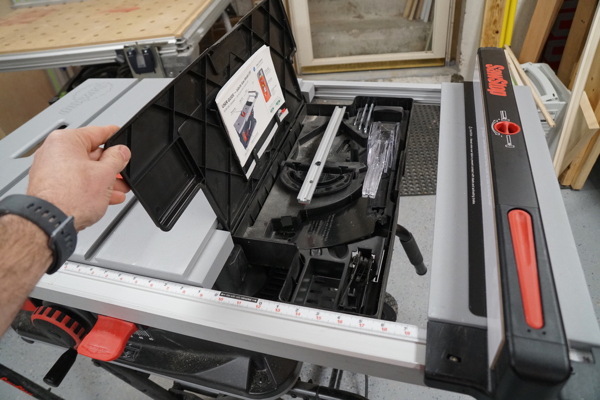 The accessory drawer conveniently stores the micro guard, riving knife, miter gauge, extra sensor cartridge, tools and user guide. 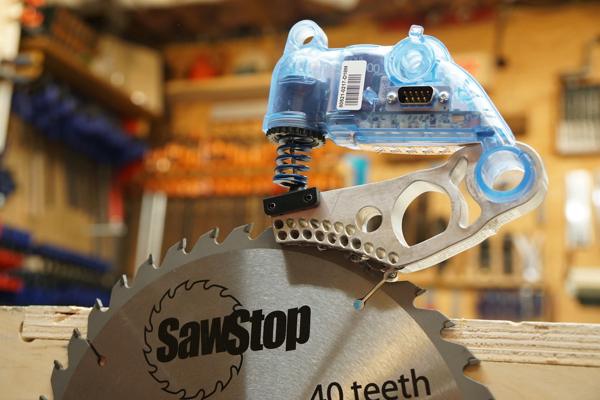 The SawStop has a rear dust port with a 2-1/2” O.D./ 2-1/4” I.D. dust port. 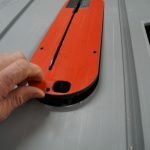 Inside the saw cabinet there is a plastic blade shroud that covers 75% of the blade and directs sawdust out to the port. 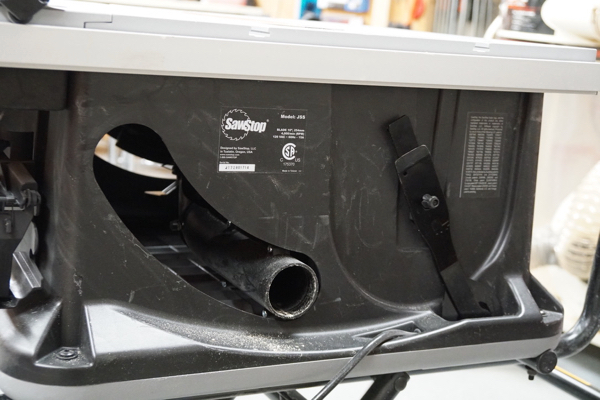 This shroud is hinged in two locations, for blade access and cleaning out dust. Magnets secure the shrouds in place. When connected to a vacuum the saw collected dust well. When not connected to a vacuum the shroud and also the plastic grid at the base of the saw collected a ton of dust and became clogged. 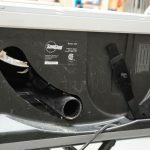 It was difficult to clean out and we wondered if the massive sawdust buildup [heat would negatively affect the saw brake sensor or electronics. 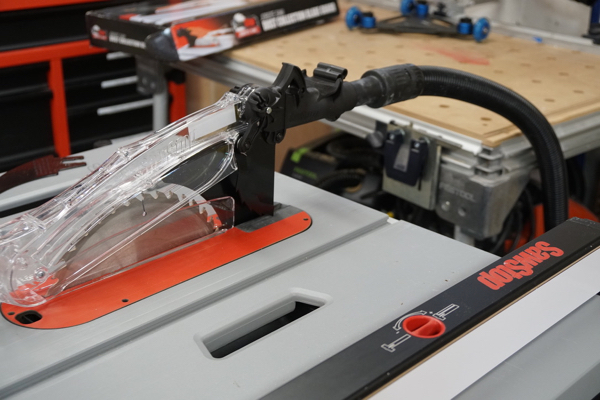 There is an optional “dust collection” blade guard [model JSS-DCG] that you can purchase for this saw. The beauty of this shroud is that it offers a top 1.5” O.D. dust port. The guard design shapes blade turbulence to better collect above-the-table dust. The only issue we saw with, unless you have two vacuums, is you’ll have to rig up a splitter and smaller vacuum house to do this. 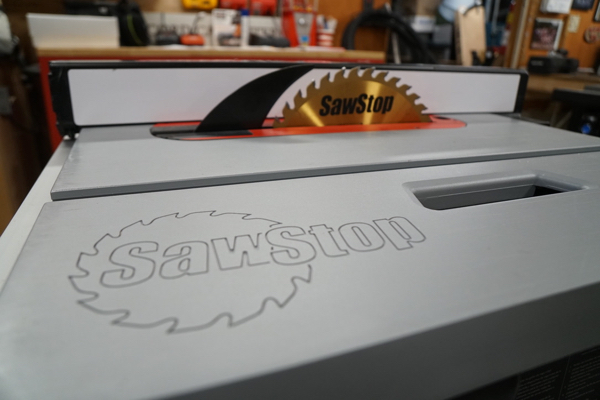 SawStop recommends that you use a standard size 10-inch sawblade or an 8” dado set up to 13/16” max. 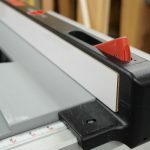 The saw will not start unless a 10-inch blade or 8” dado with the proper dado cartridge is inserted. 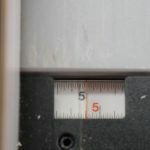 Non-standard blades, including unusually thin or thick blades may cause injury or damage the saw. Raise the blade fully, zero tilt. Use flat, beveled end of the blade wrench as a lever to push the blade slightly away from the arbor. Install new brake, and blade. TIP: Double up the blade wrenches to increase the thickness and leverage of the blades to remove the blade and cartridge. 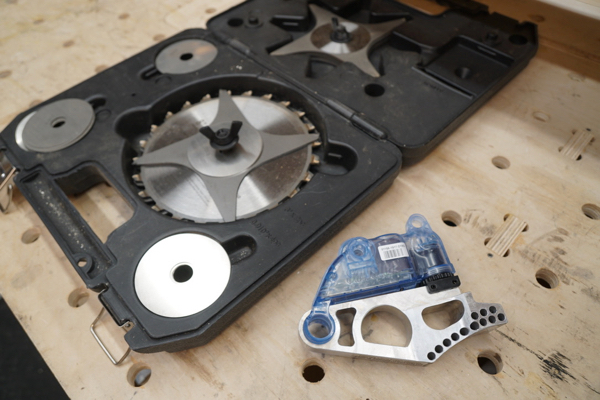 The SawStop JSS Saw will accept an 8” dado. 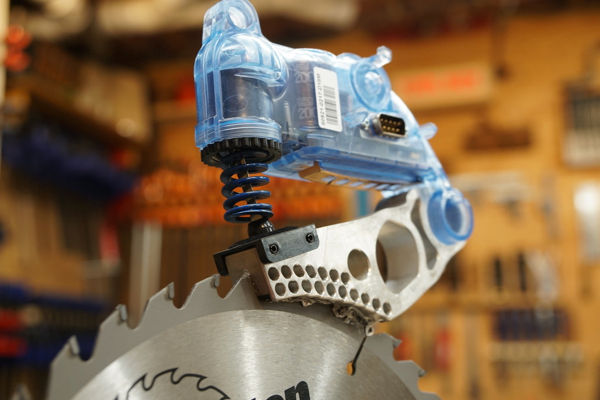 In order to achieve SawStop protection you will need to purchase an optional dado cartridge. 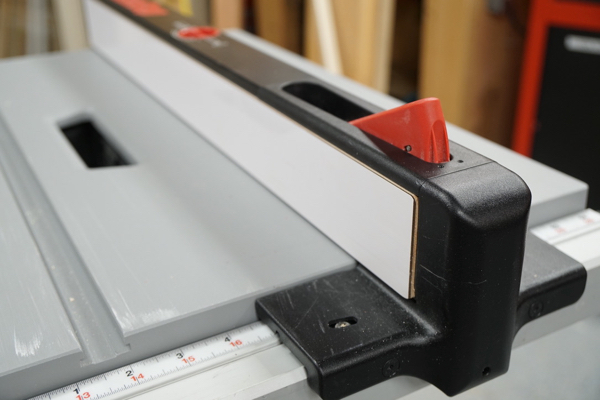 This cartridge is taller and wider to fill in the 2” gap for the shorter dado blade. An optional dado insert is also available. 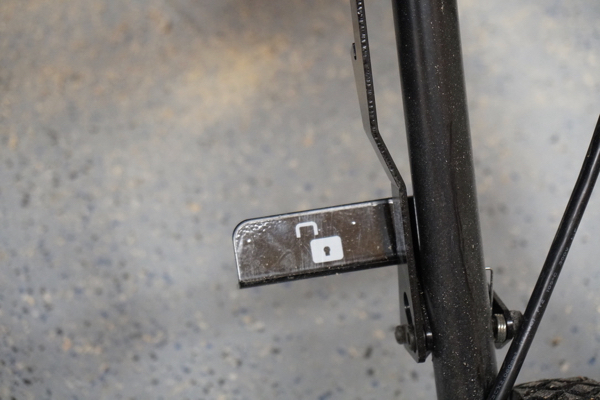 The saw mounts to a really nice pedal-activated lock release. We liked how easy this stand was to open and fold. 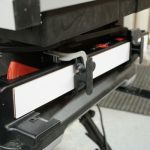 One pedal press and the tubular designed stand unfolds from a compact vertical storage position to cutting mode. In transport mode, the stand acts as a dolly with 8” wheels that allow you to easily move it over rough terrain and up ramps and stairs. 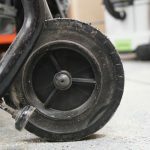 We find that 8” wheels seem to be a sweet spot for residential job site maneuverability. Obviously the BIG DRAW for purchasing and using this saw if the safety system. 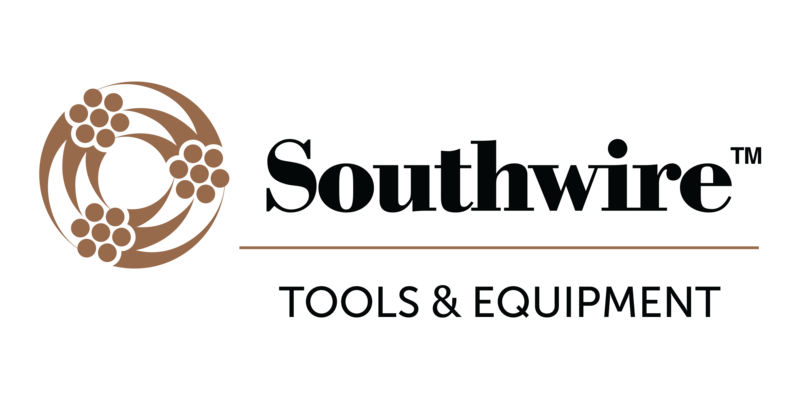 We used this saw on a large remodel over 2-3 months. We ripped framing, plywood, trim, oak flooring and PVC. The entire crew agreed that even without the safety system this was a high quality, powerful, premium machine with great features. The saw never tripped or was falsely activated. We found the saw fence easy to adjust, with excellent parallelism with the blade. We had some minor fence alignment issues, but after closer inspection we concluded it to needing to use care when ripping large sheet goods, as you can bump the fence out. 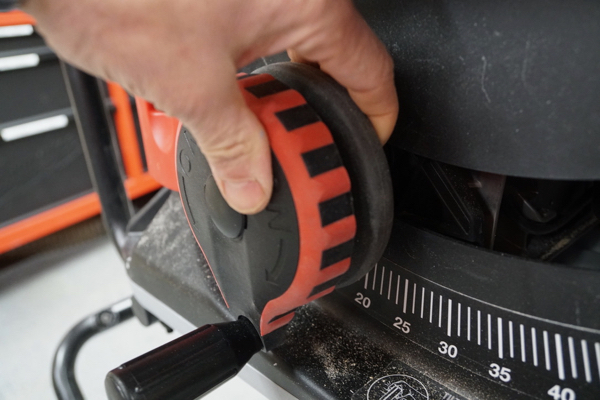 Adjusting the saw blade parallel to the miter slots was quick and easy to do, unlike other saws. The blade elevation hand wheel is the best and fastest I’ve ever seen and my FAV feature on this saw, after the safety system. This is a premium saw and there really is not a lot to ding it on. I was annoyed with the sawdust build up at the grid, located at the base of the saw. I’d like to see an easier way to clean this out. 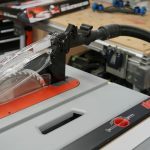 Additionally, for the cost of the saw it should come with a second brake cartridge so users can continue work if they experience an activation due to conductive materials. 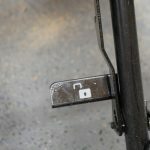 The bypass override key is a cheap plastic tab and one that we fear could fall out or get lost. We’d like to see this lock key design improved. We were curious if using the saw in the rain would activate the brake on this saw. We misted the blade with water, and soaked a board in a 5 gallon bucket of water to 30% moisture reading. Cutting this wood did not activate the blade brake. Some of the boards tested 30% wet on the surface. Obviously, this a case-by-case basis on whether the brake will activate. There are a lot of variables such as; wood grain, wood species, if the rain just wets the wood surface or if it soaks deep into the wood, etc. Embedded finish nails and staples did not set off the saw. Pressure treated wood DID and did not set off the saw. Our PT wood was 25% wet and rated for ground contact. PT wood can contain copper-based pesticides. Wood with ice on it did not set off the saw. We wet a spruce board and placed it in the freezer to see if the glazed ice would activate the saw. The items that tested for conductivity that set the saw off were PT wood, foil insulation and a sausage. 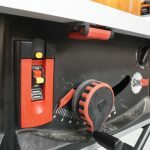 Whether you’re a hobbyist, woodworker or a in business as a contractor the money spent on the SawStop safety system is worth its weight in gold! 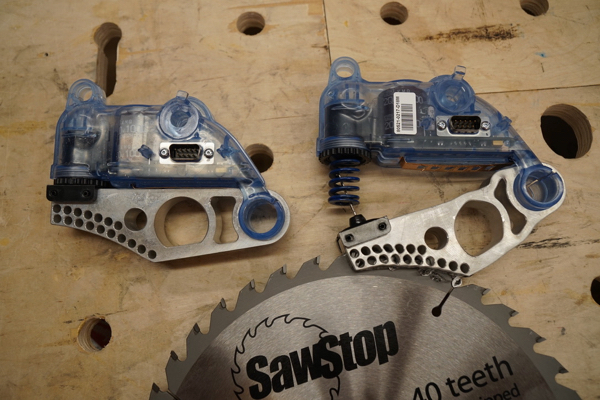 The SawStop JSS costs $1399 online here. 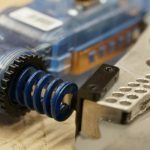 Extra brake cartridges cost $69.00 and you’ll spend $89.00 for a dado cartridge. When you stop to think about cost vs. price it makes me think. 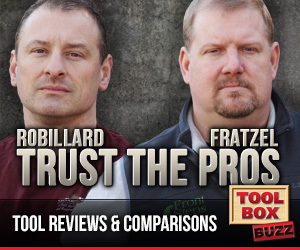 the cost of a tables accident FAR outweigh the price of this tool. 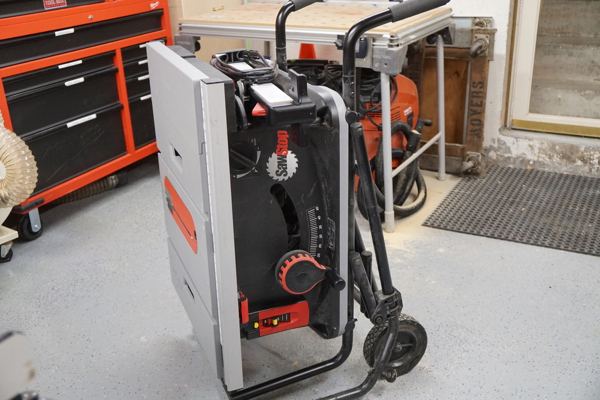 The SawStop Jobsite Saw JSS is pure innovation with premium features, functionality and compact portability. 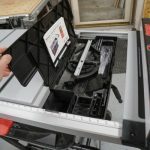 As a remodeling contractor that uses a table saw from frame to finish this saw allows me and my company to achieve precision, quality and most importantly SAFETY! I have extensive experience on this saw. The fence is just not good enough. Hard to get square and too much flex. If sawstop adopted the dewalt, Hitachi, or skilsaw fence I would consider it. Always good to know what it can do on a real site with a lot of people using it. For dado’s you will also need the table insert. 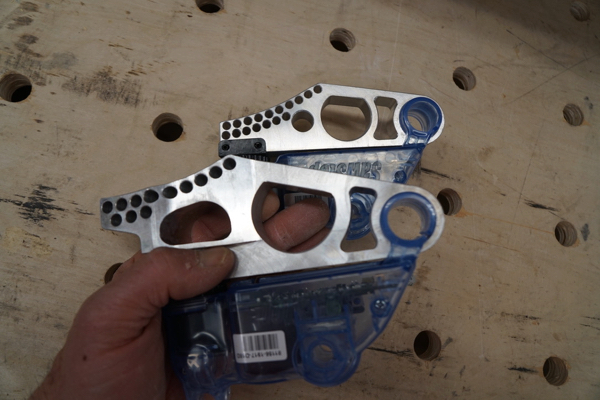 To allow the saw safety system to work correctly with dado sets, you have to have the right blades. 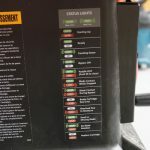 Your pictures show the Dewalt set. If you look at most of the Freud sets, you will see a pronounced hump behind the cutting edge. This is a feed limiting European safety design (I think it’s a requirement to have a feed limiting feature of some sort, but not sure and it doesn’t matter in the US). 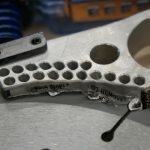 Sawstop sent out a letter to its dealers describing the problem (I suspect other Europe based brands use a similar design). The hump either slows down the energy absorption (by not cutting into the aluminum as fast) or slows down the over center trip point by softening the ‘bang’ (energy transfer or recoil). Recently, Feud started introducing sets that are ground with a curved back in a more traditional design. 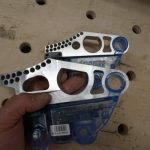 The Forrest blades never had that and are on the ‘good’ list from Sawstop. Others undoubtedly will work as well. Something to be aware of. 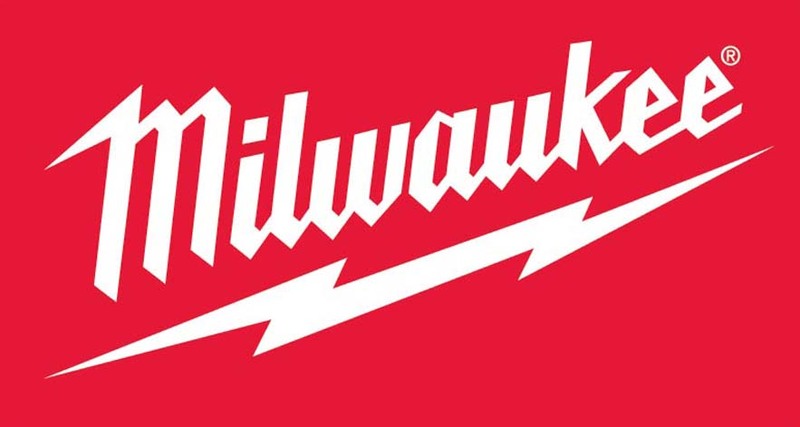 Absolutely fantastic saw. I run it everyday on the jobsite and have never had a false trip or any trip to be exact. Great saw!